I am considering replacing the R134a refrigerant in my car aircon system with a hydrocarbon refrigerant. The candidate is Hychill Minus 30 (HC-30), a Propane and Isobutane mix. 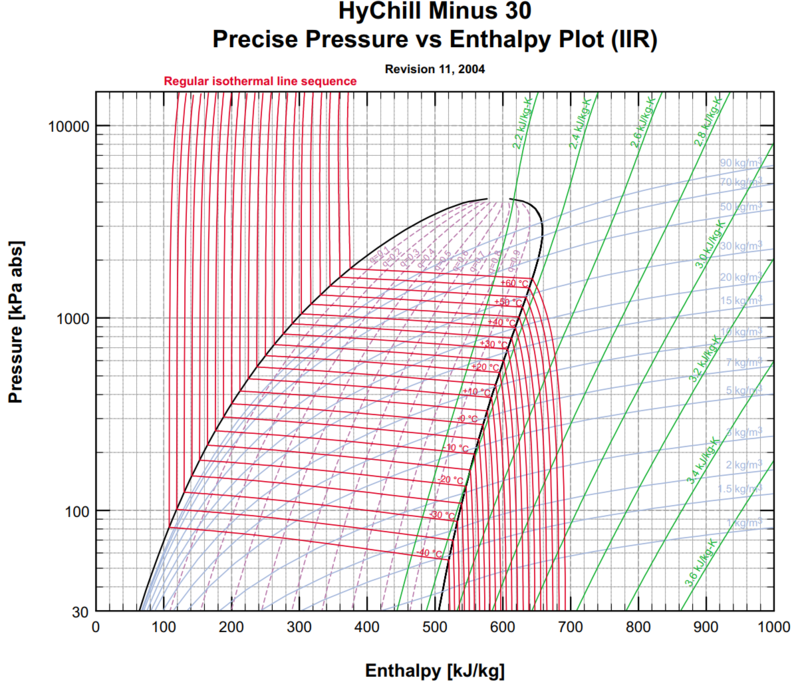 The p-H (pressure enthalpy) chart of HC-30 above was digitised to derive some comparison charts used for this study. The sampling process necessarily introduces some error, and although small, it causes ripples on graphs of some key values. 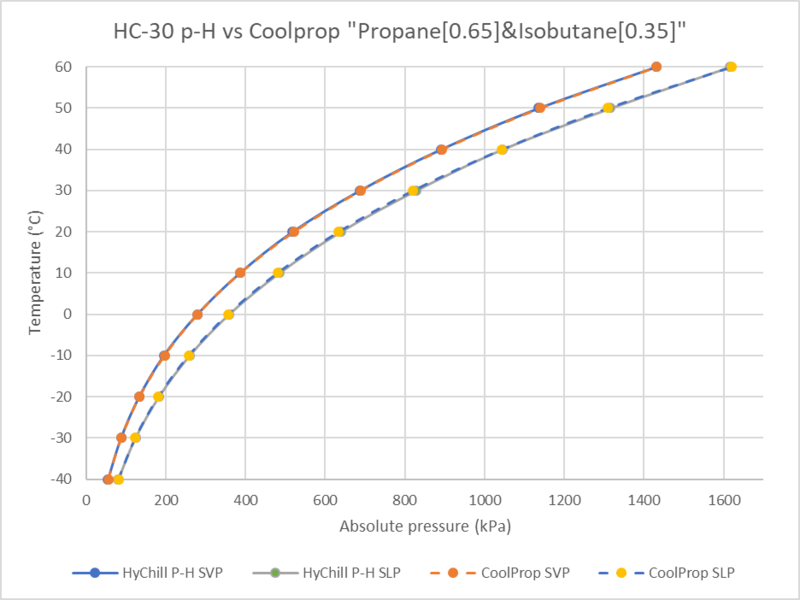 A CoolProp model of Propane and Isobutane was created, and the mix adjusted to calibrate the CoolProp model to the sampled HyChill p-H curve. Above is a plot of the sampled points and the calibrated CoolProp model. 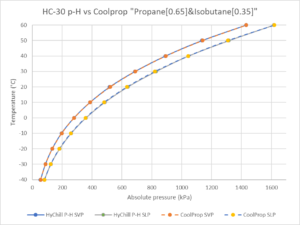 HC-30 is a zeotropic refrigerant (a mix of propane and isobutane), and so it has glide (ie the saturated vapour pressure (SVP) or dew point is higher than the saturated liquid pressure (SLP) or bubble point). As a result, it has a so-called two column pressure-temperature table being T, SLP, SVP (yes, I know that is three columns). 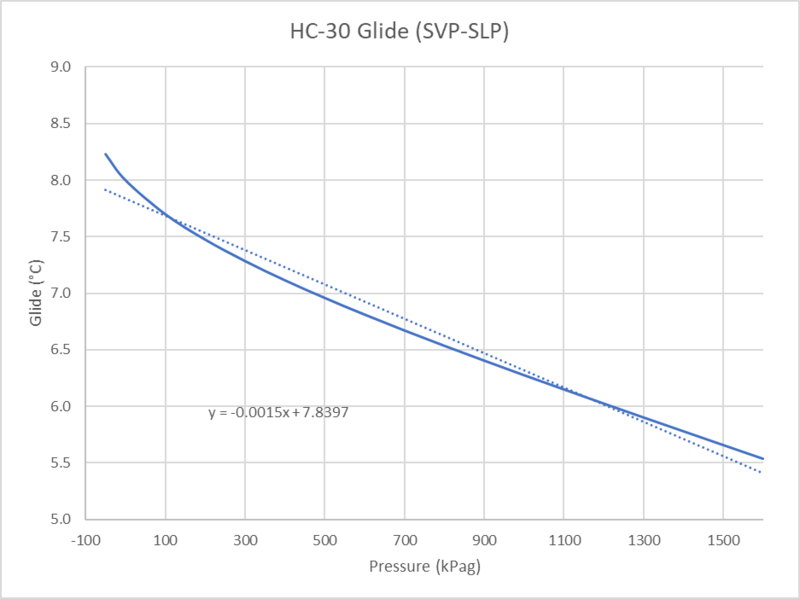 Hence, the reason for the pairs of HC-30 curves on Fig 2. Above is a plot of glide. 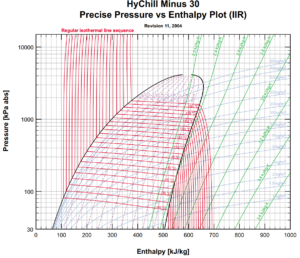 It would appear that HyChill’s published pressure temperature table which has only one pressure column is the saturated liquid pressure or bubble point. 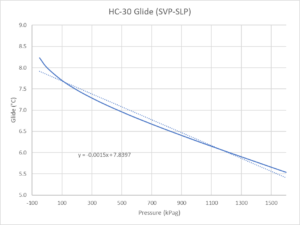 To obtain the saturated vapor pressure, add the glide from the above plot.